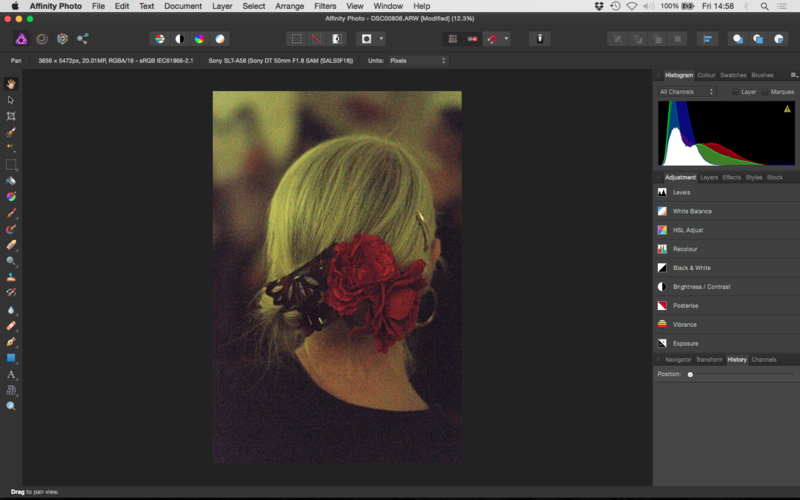 Hi, I've just bought Affinity Photo after Pixelmator kept mangling my images, AP works absolutely fine with JPG images and I can set up some really nice noise reduction in RAW but this NR then seems to completely disappear as soon as click 'develop' and wait for the blue bar to disappear. So at the moment I'm getting nicer processing by using my JPG images than with RAW (I shoot RAW+JPG on a Sony SLT-A58) which can't be right :). Any ideas? Is it a bug? I've uploaded 3 screenshots to demonstrate the problem. Can you send the file or a DropBox link to the file to support@seriflabs.com then we will try and find the problem. You will probably find that if you make any other adjustments at the same time then it will work. Thanks Tony, just sent the RAW (sony A58 ARW file) by Dropbox to that e-mail address. Nice to have a very quick response - bodes well :). I just posted on this in another thread. Did you ever find a fix? I'm finding right now, that noise reduction does not work at all on my fuji raw files. Looks great in preview then goes back to full noise after developed, and after a filter is applied in the edit persona. Very frustrating. ive read in othe threads (and also above in this one) that if you export the image from the photo persona and load in sp again, the noise reduction is not lost. for some reason it's not displayed before exporting. I saw that, too. This does not work for me. The preview of the reopened file appears to be corrected, but when I zoom in its full of noise again. 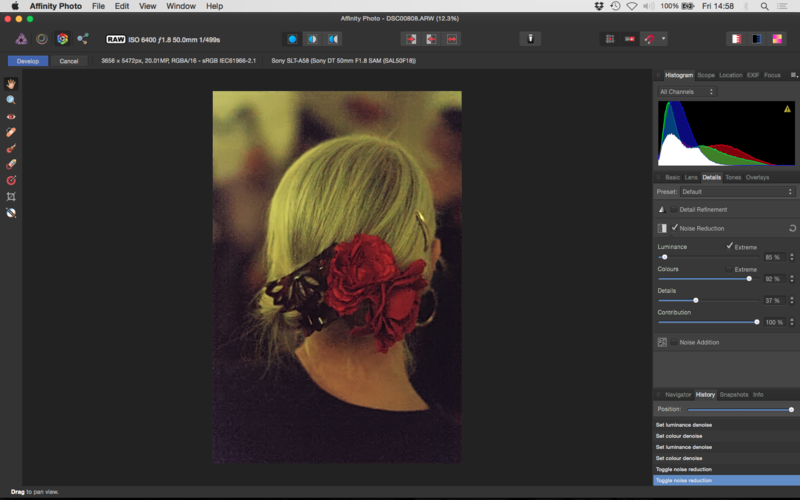 And if i export as a JPEG, the images is saved as an uncorrected noisy image. I appreciate your help, though. I'm hoping the awesome Affinity team is working hard on this issue. I saw on another thread that there was an issue with the format of the RAW file. If you convert to a DNG, do you still have the issue? I have not tried converting to PNG. I process too many raw files to take the time to do that in a daily workflow, but I will try it on one to see if that helps pinpoint the issue. Thanks for the suggestion! Also - i see there is an update tonite... maybe it will be fixed. UPDATE - After the recent 1.4.1 update, the problem appears to be solved! Noise reduction adjustments in the develop persona now stick after developing... and look great all the way to conversion to JPEG. Hi. Actual I'm using the trial version from AP 1.4.3 and have the same problem with noise reduction and RAW files like the thread opener. Hope anybody can help me. Or is it because of the trial version? Hello all, I suspect the issues mentioned here with noise reduction appearing to not work or "stick" are related to the fact that you might be previewing the effect on a mipmapped (lower resolution) version of the image - this occurs when you're not zoomed to 100%. If you're at a lower zoom level - say, 50% or 75% - you're effectively viewing a lower resolution version of the image. Therefore, with a lower number of pixels, the noise reduction will work differently compared to when it's applied to the full resolution image. When you then apply the filter, it's applied to the full resolution image, and the mipmaps (or lower resolution versions) are re-created. This explains the phenomenon of the "disappearing" noise removal, whereby after clicking Develop (or applying the filter individually in the Photo persona) the noise seems to "come back". The noise reduction has still been applied, but the settings used to adequately remove noise for the lower resolution version were likely not strong enough for the full resolution version - hope that makes sense? There's more information in this thread: Noise filter preview inconsistencies - the solution is simply to view at 100% when you're applying particular filters (namely noise-based ones) for the most accurate preview. If this doesn't solve the issue then do let us know. Thanks! thanks for this explanation. I tried what do you wrote and you are right. In an resolution at 100% than I see the noise reduction after developing.